I see this church all the time. 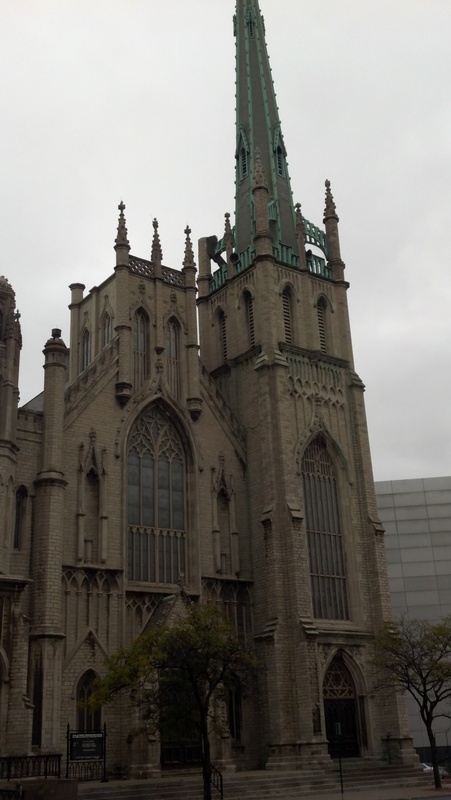 It’s one of the gems of the downtown Detroit area. It’s a beautiful Gothic Revival that looks as is if has been on that corner for nearly a millenium. The church, though, is a little more than 150 years old. The photos I took do it horrible just. I had an angle I really didn’t care for, but I would have had to dodge afternoon traffic to get better angles. I’ll be back by someday for some better angles, and shots of different parts of this amazing building. Fort Street Presbyterian Church was first organized in 1849 as the Second Presbyterian church. The congregation met in the old Capitol building until they could build their church on the corner of Lafayette and Wayne in 1850. Our present structure was completed in 1855 and the name was changed to Fort Street Presbyterian Church. 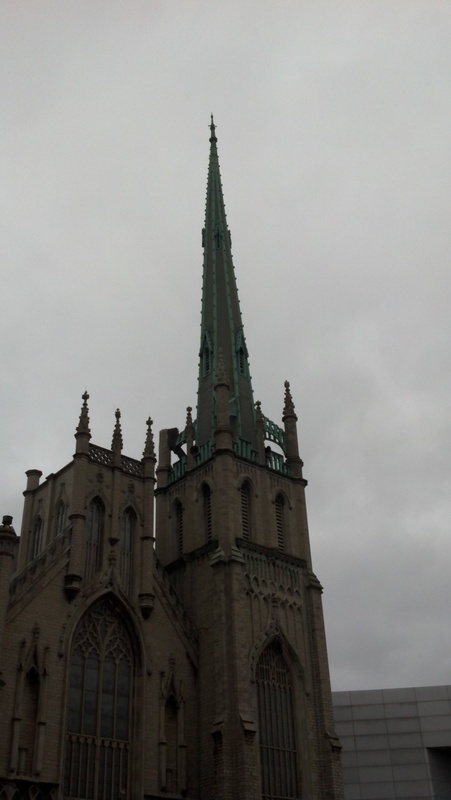 It is one of America’s finest example of the Gothic Revival architecture of that period. It was constructed of limestone from the quarries at Malden, Canada. The building is now a National & State Historical Site. At the time of its construction, Lafayette and Fort Streets were the fashionable part of the city and it was surrounded by the stately homes of such early members as Russell A. Alger, James, F. Joy, Theodore S. Buhl, Henry D Shelden, and Zachariah Chandler. The architect selected was Mr. Albert H. Jordan, originally from Connecticut. His firm was the leader in the church building boom of the 1850’s. His young draftsman, James Anderson is responsible for a large portion of our building. The membership at this time was only 167, and the total cost of building and site about $70,000. Insufficient funds made it necessary to only partially complete the interior furnishings. In March of 1870, a reconditioning program was instituted to complete the original design which included the installation of the crescent gallery and black walnut pews.